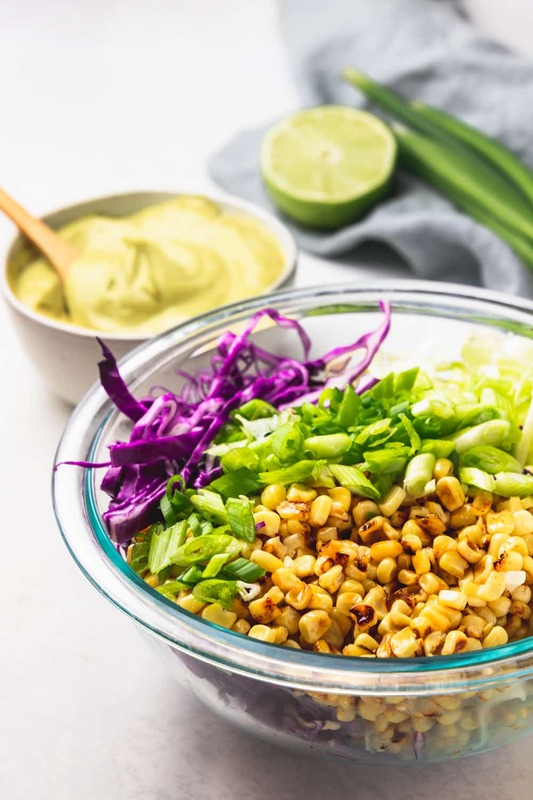 Crunchy, creamy, fresh and vibrant – charred corn slaw with avocado dressing will definitely be your new go-to salad! When Eddie and I go out to eat, occasionally our entrees will come with the standard sides – fries, a pickle, and that little, plastic cup of cole slaw. We’ll definitely mow through the fries with no issue, and usually eat the pickle too. But when it comes to the slaw, we are a couple divided. I am all for the crunchy, creamy, savory and sweet stuff. It reminds me of summer BBQ’s, pulled pork sandwiches, and fried chicken dinners. Eddie however thinks of it as the little cup of gloopy glop that no one ever ate when he was a server at Uno’s. While I’m not a hater like my husband, I do get where he’s coming from. Some slaw is gross. 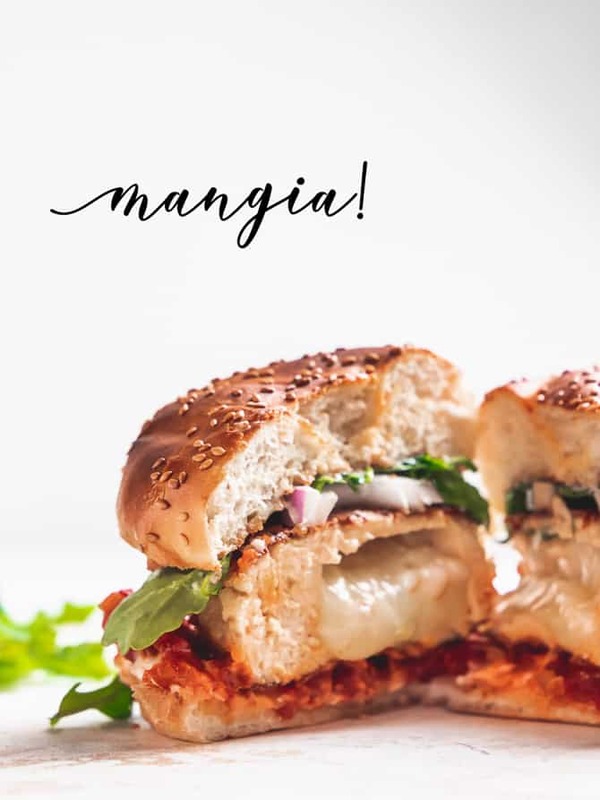 It’s watery, flavorless, weighed down with heavy dressing, or just limp and sad. It’s a shame that the worst examples of the stuff make a bad name for the other beautifully crunchy, brightly flavored versions, that dot picnic tables all over the country. When slaw is done right it’s the perfect accompaniment to so many things. And I intend to convert the masses, starting with my slaw hating husband. So first things first – this is not your standard slaw recipe. I’m not trying to pretend I’m going to make Eddie love something he’s hated for years just by replicating a great version of the OG. 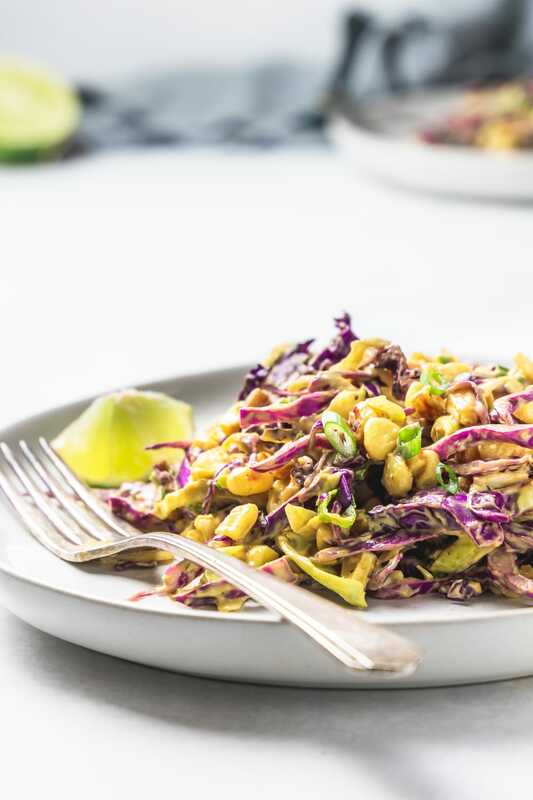 Instead I ended up marrying things I know he loves – corn and avocado – with some more of your standard slaw stuff. Then I tossed in some spices, a little lime juice for tang, took a deep breath, and maybe said a tiny prayer. Oh, also I served it with tacos (which might be cheating, because everything is good on taco night). And you know what? He went back for SECONDS. Needless to say I was pretty pumped – even if I tried play it like, totally cool brah. So what was the tipping point here? Honestly, it doesn’t really matter. Because at the end of the day, slaw is really just salad by another name. And if you make a salad that’s got a good variety of textures, colors, and a flavorful dressing that you don’t use too much of, then you’re going to be a happy camper. But let’s still take a deeper dive into how the components of this successful slaw came together. I’m not talking about the kind that you char on the grill – that would be ‘grilled corn’ after all. And to be honest, this method of charring corn is WAY easier than any of that. 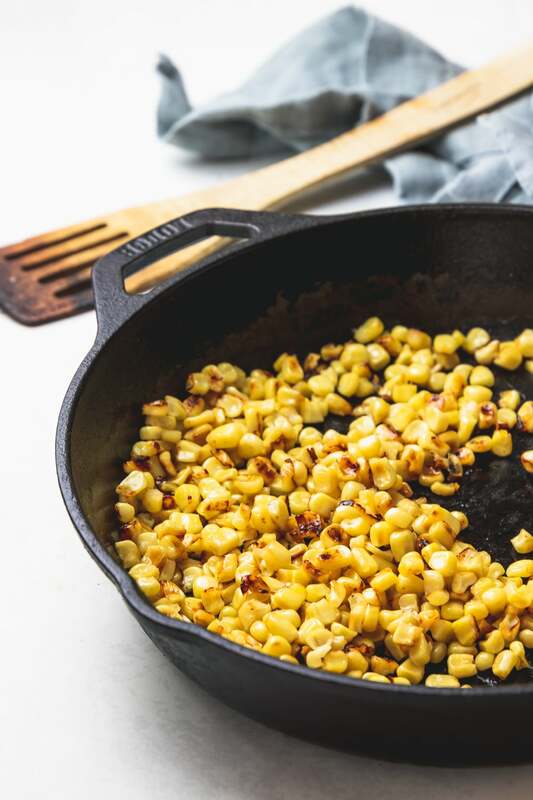 Just rip open a bag of frozen corn kernels, toss them in a hot skillet with a little oil, and leave them alone for a few minutes. When you give them a stir you should see that they’re beginning to take on a little color. The browner they get, the nuttier and more interesting they’ll taste. 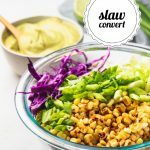 It’s this juxtaposition between sweet corn and a little bit of deep, nutty char that makes this slaw into something unique and different. I use charred corn kernels pretty regularly. They make an appearance in this easy charred corn and poblano frittata that’s a great breakfast for dinner option. Or my favorite spicy charred corn queso – which I wish I had bowl of right now. 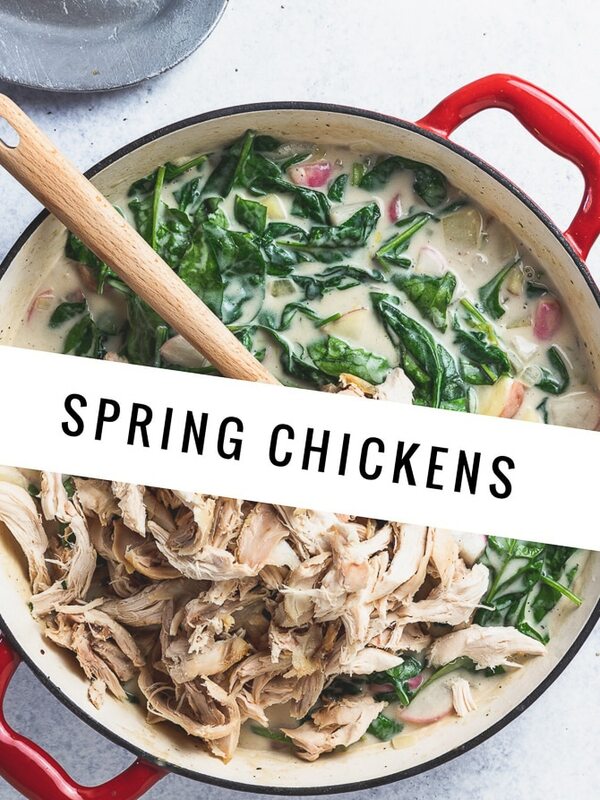 The best part about them is if you’re already going to saute some veggies for a recipe, these take about ten minutes of extra time, and almost no real effort. But no matter how fancy you get with the veggies, a slaw is not slaw without dressing. To be blatantly honest – you don’t need the “how” so much as the “what”. The how is simple. Throw all the ingredients in to a blender or food processor and buzz it up. The ‘what’ here is much more important. Because as I said before, slaw is at least 50% about the dressing, so what you put in it matters. Slaw normally involves some sort of creamy dressing. There are of course exceptions to this rule – think mayo-less versions that are mostly just vinegar based. I love those, but I’d never get Eddie on board. So we had to stick with something on the creamy side of things. Now don’t get me wrong – I LOVE MAYO. 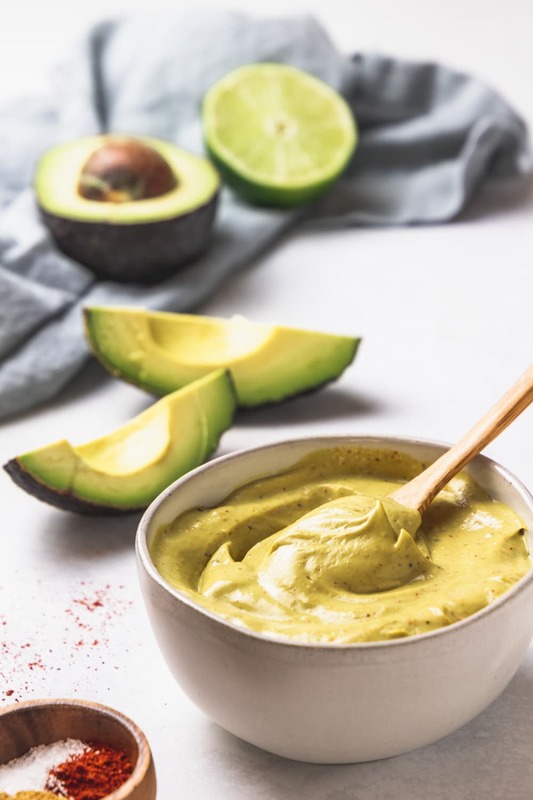 But we’re trying to veer into a new direction with this recipe, so let’s take a left turn and end up at…avocado! Avocado provides the creaminess we’re after without the grease factor that heaping a ton of mayonnaise into a salad can have. We are still using some mayonnaise, but most of our heft will come straight from that creamy, beautiful avocado. And now we need something light and bright to cut through all that fatty deliciousness – enter lime juice. In my opinion you can never have too much of the stuff. It’s tart but sweeter than a lemon, and bonus – no crummy seeds to deal with. 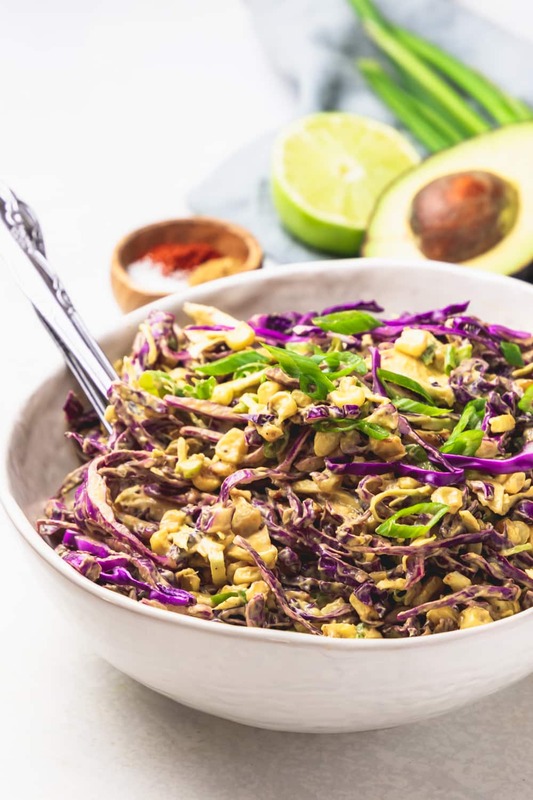 Round it all out with some Mexican inspired spices and you’ve got a killer slaw dressing. 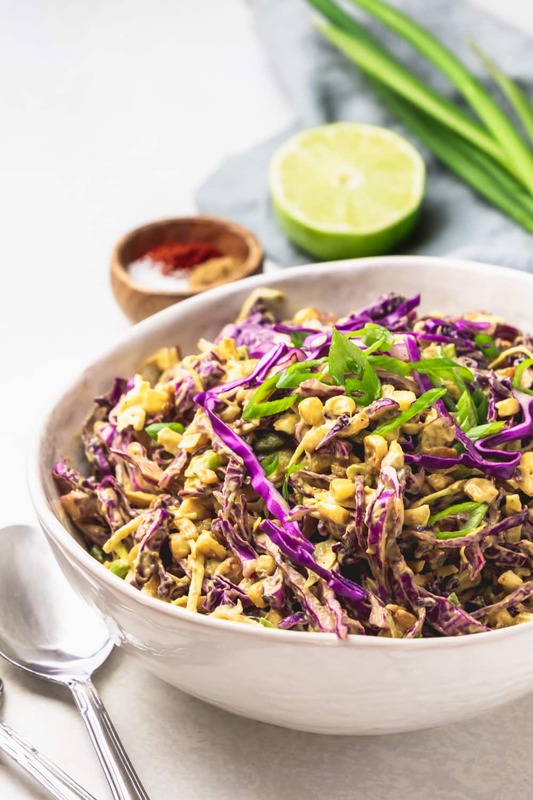 All that’s left is to toss your charred corn together with some thinly shredded red and green cabbage, a few sliced scallions (for that oniony bite) and drizzle on that dressing! But do be careful not to overdress. Remember, it’s really easy to add more, but damn near impossible to take it away. Alright, now you know how I converted my slaw hating husband into a slaw loving fiend. To be fair, that’s probably an exaggeration, seeing as how he won’t eat just any old slaw. But baby steps people. Baby steps. 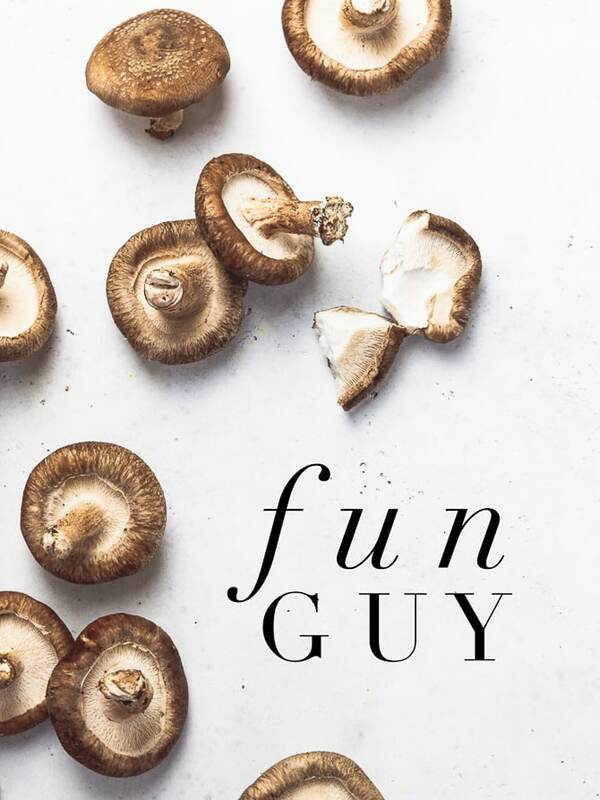 As always, thanks so much for reading, and if you made this or any of my other recipes, I’d love it if you commented below and gave it a sweet little rating. 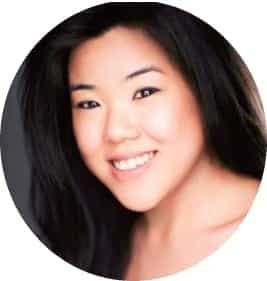 Have a happy Friday and enjoy the weekend!